Everyone wants it yesterday. So how can we deliver on time? Here are three possibly bizarre ideas. If you have the marketing department send the email, they can track how many people opened it and clicked the link to the policy. If they know what they’re doing, they can even tell you who clicked the link and who didn’t, and who read all three pages of the policy and who wandered off after page 1. 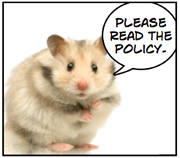 In fact, the marketing department can help you write an email that will make people want to read the hamster-sharing policy. They’re experts in this stuff. Most people who say “My team needs training” are making a ton of assumptions. They jump to conclusions about the problem (“They need to understand!”) and the solution (“They need training!”). If you let their assumptions drive what you do, you’ll waste time creating more training than is useful or effective. Then you’ll run this type of kickoff meeting, walking your client through the first few steps of action mapping. The meeting will help your client see how changes to tools, new job aids, and other non-training interventions can solve the problem. If still you end up designing training, it will probably be shorter and more targeted. In elearning we’re tempted to make up for the lack of human contact with an avalanche of irrelevant stock photos, narration, and flying bullet points. I harp on this constantly, but I’ll say it again: An intriguing, challenging activity often works perfectly well as text. In fact, once you start adding media, you can actually damage an activity, as participants in my upcoming scenario design workshops will see. Think text can’t hack it? Learn some handy phrases in the imaginary language Zeko in an activity that relies 99% on text. Or see if you can guide the AutoLoon L&D department to the best solution to their performance problem, undistracted by cheesy stock photos or narration. Obviously in many situations more time-consuming media like video, animation, and audio are absolutely necessary. 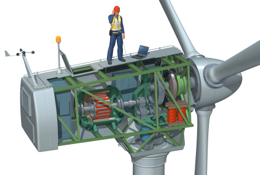 Try understanding how a wind turbine generates electricity without seeing at least a breakaway illustration of its innards. Even better, the right image can eliminate the need for text. But what I see far more often is pointless, time-wasting bling applied to a boring presentation. We could build a bunch of slides to present the content, and then spend several more hours searching for non-gag-inducing stock photos to add “eye candy,” creating slick transitions to “keep the learner’s interest,” recording unnecessary narration because we can’t expect people to read, and fussing interminably with the timeline to make the narration track properly with the flying bullet points. Unfortunately, our employers often expect bling. One way to win them over to a more powerful but less bling-infested approach is to show them several examples of challenging, thought-provoking materials designed the way we think would work best. What do you think? What has helped you create powerful training in a short time? Let us know in the comments. I love it, especially the activity. I like to have an avatar as a fellow employee talking directly to you and asking for help in doing something.Then you make choices and he/she gives you feedback on how helpful you are. Creating a repertoire of basic, non-“blingy” interactions has proven useful to drop text-heavy info into a small package, once the library has been created. Great suggestions! I agree, everyone wants it yesterday! We actually have a process in place, very similar to the “Don’t design training” suggestion. Marketing writes and delivers the content, it is wonderful. A new policy or process does not necessary need a training. Sometime it only needs the correct delivery method. To the point of selecting the correct delivery method, I like the idea of walking the client thru the action mapping; as a kickoff meeting. Clients tend to think that instructor led training is the end-all to solving problems. Diagnosis the real problem with the client present. Then you will have the clients buy-in to the true issue and how to resolve it. I spend a lot of time talking people out of running training. I generally find that a clear ‘pictures and arrows’ one page guide, or a screen capture video does the job for most staff. I deal with the rest (the strugglers or the advanced) one to one. Wouldn’t we save huge amounts of time if we shared all our materials? I work freelance and can’t believe the huge duplication of content I see in different organisations. Many L&D departments design their own work – then give it to me to deliver and it’s usually always things I’ve seen before. The idea of intellectual property is a myth – have you ever seen an interview skills course say don’t listen? Don’t build rapport? Don’t ask open questions?!! Rather than moan I’ve developed a free to view, not for profit website where I ‘ve got others to share all their content. I know when I worked in L&D it would have saved me heaps of time if I could look at what others had done, their slides and facilitator notes, handouts etc.., I ding even ask people to log in as I can’t be bothered to build a database of people I’ll never send junk mail to. Ugh – wheel reinvention is a huge time waster. Hopefully I ‘ll eradicate that. As I read some of these articles, they peaked my interests because I spend a lot of my time training others. Thank you for the tips. I’m currently getting my masters in TRDV at Roosevelt University, but have also worked in the corporate training world for about 5 years now. I am all too familiar with your point #2 of managers coming to us saying “they need more training”. I once had a professor that share a story with us about employees not punching in at a time clock for their shift. The manager requested training of “how to” and why it’s so important only to find out it was because the time clock was at the opposite end of the door they entered for work so it was more out of inconvenience than not knowing how. The time clock was moved and the problem solved. As learning professionals this is a huge time saver to ask the questions of “help me understand the problem” so our time may be better spent on the real training issues. Great Article! I second the idea of shorter and more concise training. What is like even more is the thought that before creating training, trainers should actually spend some time looking for ways how NOT to create it – and thus resolve the organizational issues that may lead to problems which training would not resolve anyway. I’m going to try this very first time someone asks me for the training for their people! Thank you for the inspiration!!! I think the concept of TARGETED training is one we all struggle with. Even when a needs assessment is conducted we tend to allow our business to scope creep and take our training in potentially different directions. If we are able to keep both the director of the project as well as the training focused we increase our chance for success. Thank you for the article it was great! Nice article, especially I liked the concept of disguise meeting to understand the need of the client.